Rugged Dog Boots by Ultra Paws. Rugged Dog Boots are easy to put on, with expanding side seams and two adjustable Velcro closures. 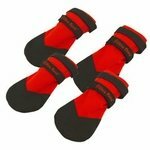 Neoprene foam cushions your dog's foot around the closures. The sole is made of "Reprotek," a 1.2mm thick recycled tire material that is flexible, skid-resistant and durable -- perfect for tough outdoor use including asphalt and concrete. Rugged Dog Boots perform in wet and dry, hot and cold conditions.